Friday November 4th 1881 I soon got my work done up this morning and practiced nearly two hours before dinner. Hatt was over here a few moments this morning. I went over town in the afternoon and visited at Wins till bed time. The friends went on down to the valley this morning. 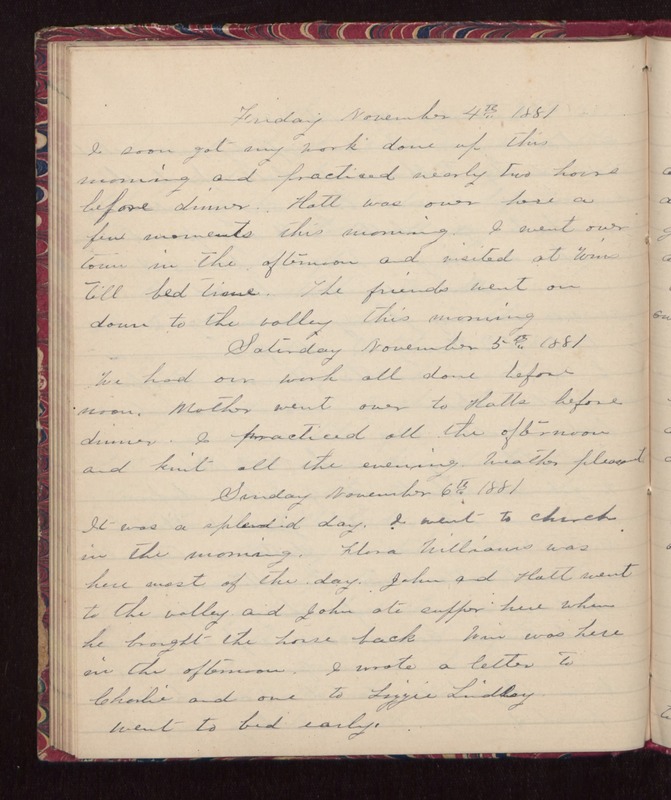 Saturday November 5th 1881 We had our work all done before noon. Mother went over to Hatts before dinner. I practiced all the afternoon and knit all the evening. Weather pleasant. Sunday November 6th 1881 It was a splendid day. I went to church in the morning. Flora Williams was here most of the day. John and Hatt went to the valley and John ate supper here when he brought the horse back. Win was here in the afternoon. I wrote a letter to Charlie and one to Lizzie Lindley. Went to bed early.